B. Thomas (Arlington, Texas, United States) on 27 January 2019 in Lifestyle & Culture. 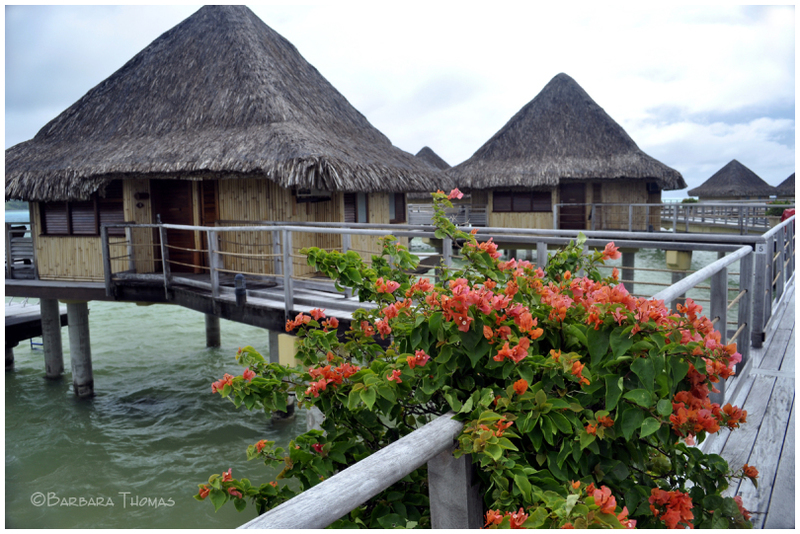 Modeled after traditional Polynesian fare houses, the stilted overwater bungalows reach out over the lagoon. The roofs are woven from pandanus leaves, and each one has a jetty that provides direct access to the water. The private terraces are a great place to relax and admire the sunset. *In January, 2013 I got to go on my bucket list dream trip to the French Polynesian Islands of Tahiti, Moorea, and Bora Bora. Some photos were posted here on Aminus3 at that time, but there are so many more that I never got to. I will revisit the beautiful island of Bora Bora for this next series. Fine way to build house. I should image sitting there and watching the sun going down must be wonderful. Lovely...but the constant fear of the rising waters is always there ! @Devi: Rising water was not an issue there. Each their own entrance bridge, how fabulous. Charming. What a fun and beautiful place to stay. That looks like fun . . . in calm weather. A really wonderful experience. I would love to vacation at a spot like that.